This month we are examining three types of game balance and how creators implement these types into game design. This week we’ll look at Internal Balance; the opportunity cost between available options on a player’s turn. Internal balance covers objects such as locations for worker placement or a player’s upgrade decisions using a tech tree. A primary concern of game designers is to ensure a game has strong replay value and provides a varied experience each time it reaches the table. Internal Balance increases the longevity of games by eliminating false decisions and regulating dominant strategies. Games challenge us by providing interesting decisions and allowing us to choose our own path. The choices can be weighed in several ways from offering immediate scoring value, allowing us to pairing actions into strong combinations or giving us a chance to speculate potential for greater value in the future. These changing valuations provide the core for many great designs but they require a foundational premise that all available actions have value. If an option is presented (often unknowingly by the designer) that is always sub-optimal it becomes a false decision. In game theory (a study in decision making often used in economics) this false decision would be considered “strictly dominated”. Experienced players will always ignore the choice. New players face a dangerous learning pitfall. As players progress through the learning curve of a game they will reach a point of firm understanding and always seek optimality in decision making. Experienced players will pass over false decisions but will still face an unnecessary burden: having to redirect their focus each time this false decision is presented. Beginning players have the greatest disadvantage as they start any game with an assumption that all options are viable. Without the experience of advancing through the learning curve, an inferior option will cause new players setbacks. This setback is in addition to any other strategic mistakes they will ordinarily make in their first few games. False decisions are a poor method of separating player performance through skill as it correlates more closely with inexperience than inability. Along with providing interesting decisions, designers use internal balance to increase replay value by implementing multiple paths to victory. These are divergent strategies or routes players can pursue in order to achieve the primary objective. The second purpose of Internal Balance is to identify and control dominant strategies; paths to victory which overwhelmingly offer the greatest chance of victory. As players, it is in our nature to strive for optimal choices in games. If a particular strategy is found to be dominant, all other paths to victory become inferior and will be ignored by perceptive and veteran players. This severely limits replay value as game variation becomes limited and even recursive: a flaw that transitions a game into merely a puzzle waiting to be solved. Internal Balance uses two frameworks to implement equality between game choices. The first framework is to apply a Transitive Relationship which applies a scale or cost curve when evaluating objects in a game. Transitive Relationship Arrows indicate balancing techniques described below. Transitive Relationships use a cost curve in order to find comparable objects. Costs don’t have to be fiscal as attaching drawbacks can be a method to offset powerful abilities; a byproduct from this method is an increase in variety of how players conduct their strategies. In Power Grid early power plants are made obsolete by later plants over the course of the game. The later plants feature improved fuel efficiency and are able to service more cities. While no two plants are alike, higher level plants have benefits offset by a higher minimum cost and in some cases more expensive fuel sources. 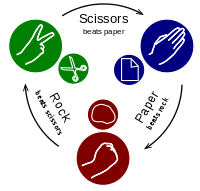 The second framework that can be applied an Intransitive Relationship which is a fanciful way to describe a “Rock-Paper-Scissors” relationship; one in which each object has a natural weakness or counter among the other objects. In Stratego each player battles with individual pieces ranked numerically where the superior rank wins any challenge. The highest rank is called the Marshall who has incredible power, but can still be defeated by the spy. The spy is limited to this special role and loses to any other piece. In Stratego the Marshall is part of an Intransitive Relationship which prevents it from acting with complete impunity during the game. Player Driven (Transitive): What better way to implement balance than to allow the players to decide the value? In Vegas Showdown players bid on upgrades to their hotel and casino during an ongoing auction. Each upgrade has a opening price which decreases each round it goes without a bid. As players outbid one another they set an effective market price based on how the game is progressing. Starting prices offer a guideline to approximate values but don’t interfere with the player interaction as competing casino mangers clash. San Marco uses the idea of “I divide, you choose” to distribute cards to players. Each round a player acts as Distributor who will take the available cards and divide them into offerings (sets of cards). One offering is created for each player in the game. The essential realization is that the Distributor will pick last among these offerings and therefore must ensure they are divided as equally as possible, as they will very likely receive the worst one. The tension of distributing the cards is the core of the game and places the act of balancing into the hands of the players. Player driven mechanics such as auctions and “I cut, you choose” use the transitive framework as objects are selected at a point of market equilibrium which prevents excessive gains. Auctions also utilize a common currency which allows objects to share the same cost structure. Remove pressure on designers to create perfectly balanced static costs. Allow increased player interaction while players set market price. Not a good solution if objects are difficult to value. Complex or highly situational objects can go at extremely inconsistent prices. Auctions are best used as a core mechanic or to help strengthen a game with minor disparities in valuation. Auctions have the unfortunate tendency to be used as a shortcut method to balance a game design and can produce underwhelming results. Drawbacks (Transitive): Give objects with great strength a tragic flaw. In Cleopatra and the Society of Architects players collect resources by selecting a group of cards. Standard resource cards are used to construct buildings and generate points. Also available are tainted resource cards which offer double the resource benefit, but add a corruption token to the player’s total when used. The player at the end of the game with the most corruption is eliminated before final scoring. In Kingsburg players collect resources to construct buildings from a tech tree as they prepare to battle invading forces. Early buildings offer a smaller point value and limited abilities while later buildings provide greater point values and powerful abilities. If a player loses to an invading force they will frequently lose their most advanced buildings first. Players who advance too quickly in their tech tree can quickly lose ground if they are not adequately prepared for the invasions. Weaknesses utilize the transitive framework as objects carry an additional cost that may reduce their effectiveness, and bringing them back into alignment with the slope of the cost curve. An extension of this method can be to institute a resource limit or a spatial restriction that relates with the strength of a game object. In San Juan, players use cards as a form of currency. In order to construct a building with a cost of three, a player must discard three cards from his or her hand. The most impactful buildings carry a higher cost or five or six but are further balanced through the enforcement of a maximum hand size of seven. This inevitably reduces flexibility for players as they attempt to hold on to powerful but expensive cards. Weaknesses can help shape a strategy by informing a player what to avoid. This can help spread players out from piling onto the same strategy or repeatedly accumulating the same resources. Weaknesses create a negative in games. If players need to be weary of too many things in a game it can feel restrictive, reduce enjoyment and prolong the time turns may take. Risk/Reward Ratio (Transitive): Allow players to gamble in order to achieve results. Ticket to Ride rewards players for selecting and completing tickets: specific routes that provide points based on the length of a connection between two cities. At the end of the game players subtract the point value for any routes they were unable to complete. In Incan Gold players are explorers who share their collective treasures while facing unknown dangers. Players may withdraw at any time and keep their current share as too many dangers will cause active explorers to lose everything. The greatest rewards come at the very end of each round of exploration which is also the most risky time to continue pushing forth. A Risk/Reward Ratio is often implemented by using a push your luck mechanic. Players put their current potential value at risk as they seek an even greater reward. This uses the transitive framework as players must pay a cost by risking value in order to gain value, normalizing results with an expected value which is in line with the slope of the cost curve. Risk and Rewards can engage players with excitement as outcomes can swing wildly. Luck can often play a significant factor in the outcome of games. Compensate (Transitive): If an object can be ignored, decrease the opportunity cost. In Small World players select from randomly drawn armies to take into battle. Five races and five special abilities are paired and ordered from top to bottom. Players may select any available army but must pay one victory point to each race they pass over. As perceived weak races are passed over they can accumulate a significant point bonus. This mechanic is called line drafting. In Puerto Rico players select from roles that provide the driving force in the game. At the end of a round each role that was not selected gains one doubloon (currency). Doubloons have a major impact on the game and will create an enticing choice as they accumulate. Compensating by adding value increases the marginal value of inferior options, bringing objects upwards into alignment with the cost curve. Valuing objects creates an interesting decision by using an intuitive and gradual method. If a player’s optimal path doesn’t include an object, how long before the player must begin to consider it as a possible alternative? If objects are too static, you can have the same game outcome each time. If an object frequently accumulates a high compensation value, was it really balanced to begin with? Diversification (Intransitive): Objects begin with a baseline of general ability and provide each object the option to specialize. In Dungeon Roll players use a party of adventurers in the form of dice to fight monsters, accumulate treasure and eventually face the dragons lair. Ordinarily each one of the party dice can defeat one monster, however each type also has a special ability to defeat all of one type of monster. Additionally, as players continue their dungeon exploration, they must maintain three different types of party members in order to defeat the dragons. In the Pokémon Trading Card Game players build decks of different Pokémon types. Each type of Pokémon has strengths and weaknesses towards several of the other types in an elaborate Rock-Paper-Scissors system. The system encourages players to include multiple types of Pokémon in their deck in order to be able to handle a wider variety of opposing decks. Diversification can commonly be found in RPGs in which teams will face specific situations in which each member can feel like the star player. This allows several players in each game to feel like the essential piece that holds the group together. Every object or character has a baseline of aptitude and can be serviceable even when options are limited. Creating a minimum expectation of ability removes variables from the balancing equation. Specialties will require diverse characteristics. This can present a challenge as objects or roles need to be dissimilar but still function on the same playing field. Would something like comparing a spearman with attack 7 and a swordsman with attack 2d6 count as ‘risk/reward’ ? One is always better then the other against lightly armoured foes, whilst the other is needed if a single heavy armored knight turns up. I think your example could be risk/reward if I interpreted this correctly and the two sides are battling. If we are directly comparing the attack values between the spearman (static value of 7) versus the swordsman (normal distribution from 2 to 12 on 2d6) we have an expected value of 7 for each. The Risk/Reward ratio comes into play when a cost is instituted with the outcome. A likely example would be that the losing side has their swordsman/spearman removed from the game. Players can use the knowledge of this potential risk and attack when it presents the greatest strategic benefit. An extension of your example offers the opportunity to implement an intransitive relationship as well. Adapting your example, it could be Spearmen < Archers < Cavalry < Spearmen where Archers have a range advantage over slow moving Spearmen but lose to the speed of Cavalry who approach far too quickly to target. Meanwhile, the speed of Cavalry serves no advantage to the weapon length advantage of Spearmen in melee combat. Rise of Nations, a computer RTS from the early-mid 2000s, implemented exactly that “rock-paper-scissors” relationship with its infantry, cavalry, and archer units. In general, any example of expanding a distribution–keeping the same expected value, introducing the possibility of better results at the cost of introducing the possibility of worse results too–is a good foundation for a risk/reward-style mechanic.